Learn how to protect your outdoor kitchen this winter. 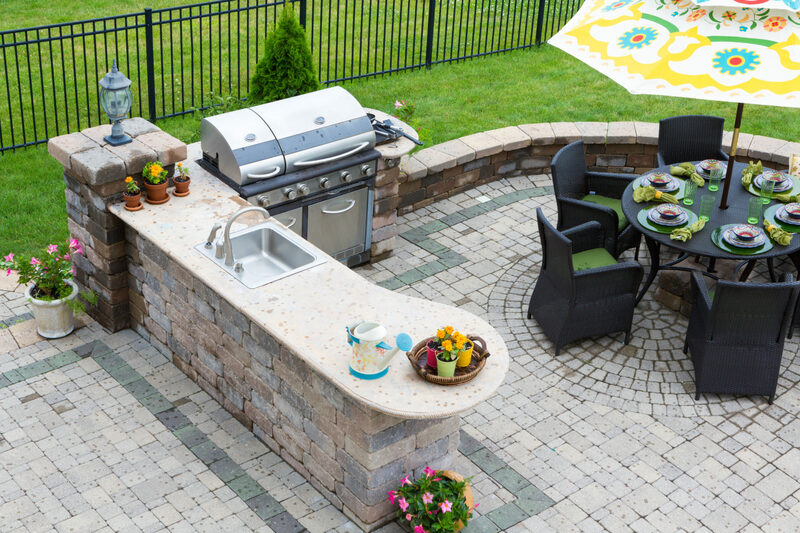 Your outdoor living area is your personal oasis, especially the amazing outdoor kitchen that lets you relax with your guests all summer long and still get the cooking done. But summer is long gone, and your forecast app has snowflakes on it! Have you prepped your outdoor living space and kitchen for the cold, ice, and snow of winter? Now is the time! Converting your outdoor kitchen and living area to a screened-in porch is the most comprehensive way to make sure it stays safe and secure during the winter. You can choose from permanent screens or retractable ones, which will let you choose to open up the space again or leave it enclosed as you desire. Either way, the enclosure should keep the snow and other debris out and all your appliances safe. Purchase and use the covers that are meant for your appliances. Make sure that your grill has a cover and that it is securely tied down so it doesn’t allow water to seep in. Another important cover is for the sink. A secure sink cover will ensure that leaves and other debris don’t make their way down the sink and cause problems next spring. You know that you need to winterize your irrigation systems, but you also have to winterize all the pipes leading to your outdoor kitchen. If you don’t make sure they are properly shut down and drained, the winter freeze could lead to big problems. Unless you move your whole house to an area where it doesn’t snow, there will eventually be snow that you have to deal with, which means shoveling. Make sure that you have a plastic shovel to use in your outdoor kitchen. Metal can cause damage to the decking, cabinets and even appliances in your outdoor kitchen. While you’re shoveling, go easy and don’t dig down too aggressively, even with the plastic shovel. Consider getting a stiff bristled broom to sweep the snow off of your appliances. Finally, don’t use salt or sand on your outdoor kitchen. The salt can be corrosive, and the sand can scratch the appliances. If your budget can support it, radiant heat is an excellent option. A radiant heat system will be expensive to install, and there are also costs associated with running it, but it will keep the entire area dry and usable all season long. This entry was posted on Thursday, November 15th, 2018 at 4:27 pm. Both comments and pings are currently closed.